We built a DIY zinc top table and it is the first piece of furniture that we have ever built. I had seen a smaller farmhouse table with a zinc top at my favorite high-end furniture store, and the table was priced at $2500. We built the table base with pine boards and we added gorgeous chunky farmhouse legs to the table which make the diy zinc top table look very expensive. We stained the base and legs. I wanted a zinc top so we did some researching to find out about our options. I did a tutorial post on how we built the base of the diy zinc top table and I did a tutorial post on how we found the zinc and added it to the table top. My husband and I signed up for a small group class at our church that was called “Sawdust”. The class was held in our church’s workshop and the instructor wanted everyone to work on a project and he told us that he would help us. We both thought about it and my husband said he wanted to build a table and I knew what I wanted the table to look like. I knew that this would not be a cheap project but I wanted something well made and something that might stay in our family for years. 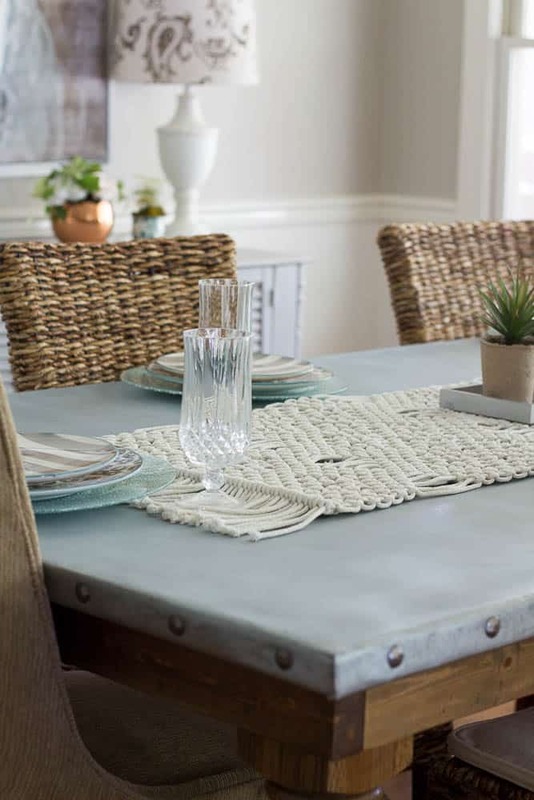 I know they thought I was crazy when I said that I wanted the farmhouse tabletop to be covered in zinc. I got the same look that I get when I run some of my ideas by the employee at the Home and Garden store. Luckily for me, I had the inspiration pictures on my phone and everyone thought that it just might be gorgeous. We did end up saving a good bit of money by building the table ourselves. The instructor advised us on how he thought the base should be put together. We purchased pine boards for the base and two large plywood boards that we glued on top of each other for the table top. We knew that the boards would be covered. We chose these stunning chunky table legs from Tablelegs.com. 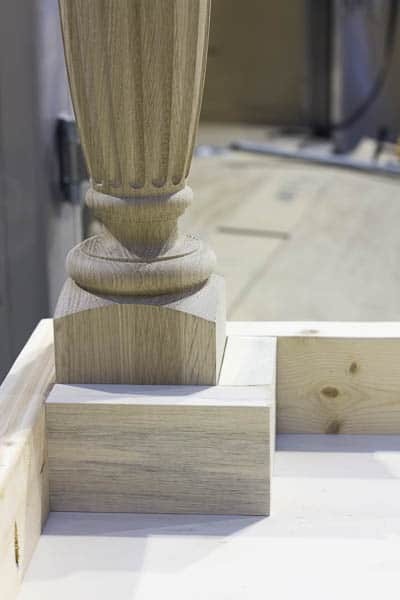 The legs we used are called extra-large fluted English tavern legs. The company was wonderful to work with and they advised us on which legs would look best with this table. Side note: All the chairs were thrifted. Thrift store score! Sign up for my emails to get my “Secrets to Thrift Store Shopping” plus more freebies! I am going to be honest and tell you that I thought for a minute that I might paint the pine boards to look like zinc but that was immediately shot down by everyone that heard that idea. We found our zinc at Rotometals.com and I could not be anymore pleased with how beautiful the zinc looks. It looks even better than I pictured it in my head. You need to read the post if you are planning on doing this because I have some suggestions that will make it easier. My husband and I had so much fun working on this table but we had some challenges too and you can read about in the post. The hardest part was getting the heavy table from our garage into our house. Our plan was to take the table to our lake house but we love the table so much that it’s in our kitchen so we can look at it every day. 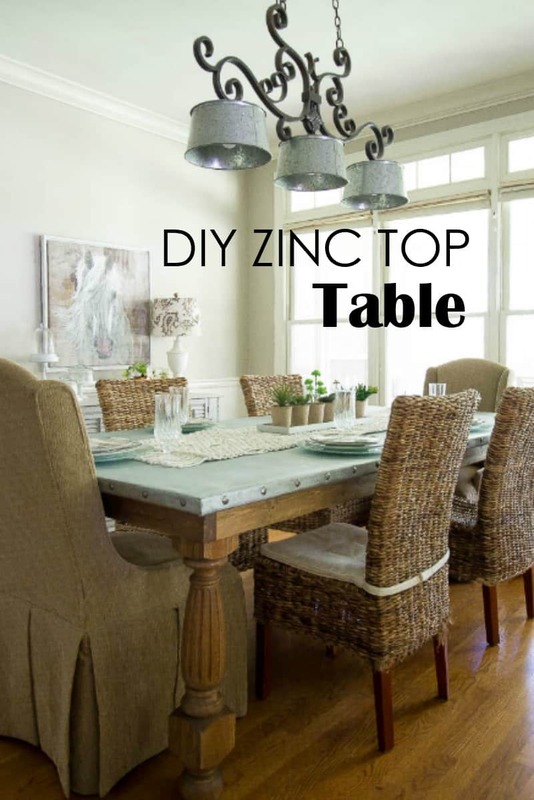 Check out DIY Zinc Top Table-How we built the base and How we applied the zinc. Wow!!! Your table is stunning!!! You did a beautiful job on it! I love it!!! Y’all did a great job. Thanks for sharing. This is gorgeous! Do you know if zinc rusts? This would be an incredible look for a picnic table too. Thank you for sharing your talent. Thank you Patricia! I responded to this the other day but I don’t see the comment. I am not sure if you got your answer so I will reply again. The company told us that zinc will not rust but it will corrode and patina over time unless you seal it. You can even put a chemical on it to make it patina faster but I didn’t want the patina look. We just put a sealer on top of the zinc so that it will stay looking like this forever. I would email the company, Rotometals, and ask them if it will be okay outside. Wow – I’m so impressed that you made this! I would have been stumped by the real zinc top! It’s absolutely beautiful! You and your husband should go into business – haha! Wow! What a gorgeous table. And I love that you built it together. Once again, your magic found it’s way into an incredible piece. Running over to read how you did it! Amazing. Thank you Nikki! I am so gland that the project went well! I can’t stop looking at it. Holy Mackerel my friend…you are craazy talented. I love this table so very much…Congrats! I know you are so very proud of the outcome. Loving every thing about it. 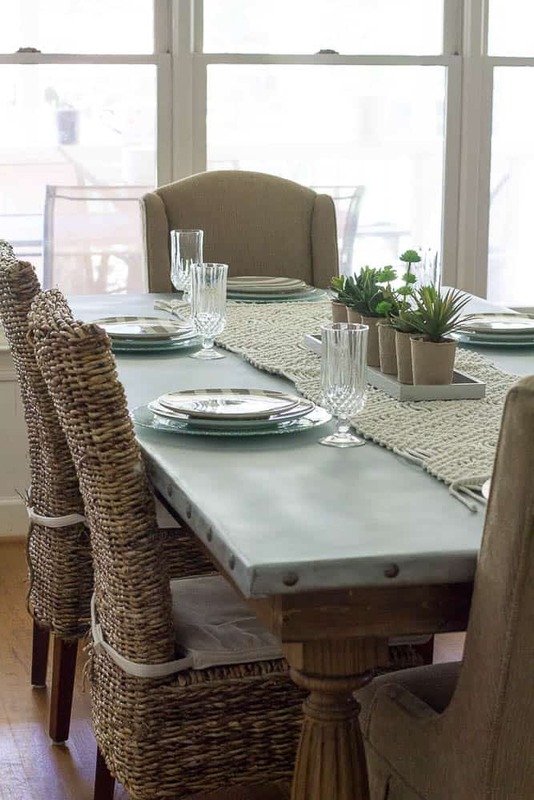 Thank you, Stephanie, for featuring my table and for sharing it! It’s really beautiful! Thanks for sharing @ Vintage Charm–pinned! I actually painted out table top to look like galvanized metal because of our curved edges. We love it but I would soooooo love your table more! It’s fantastic! Saw this on the Creative Corner link party! it turned out amazing!!! great job!! Your table is fantastic! What a great project. 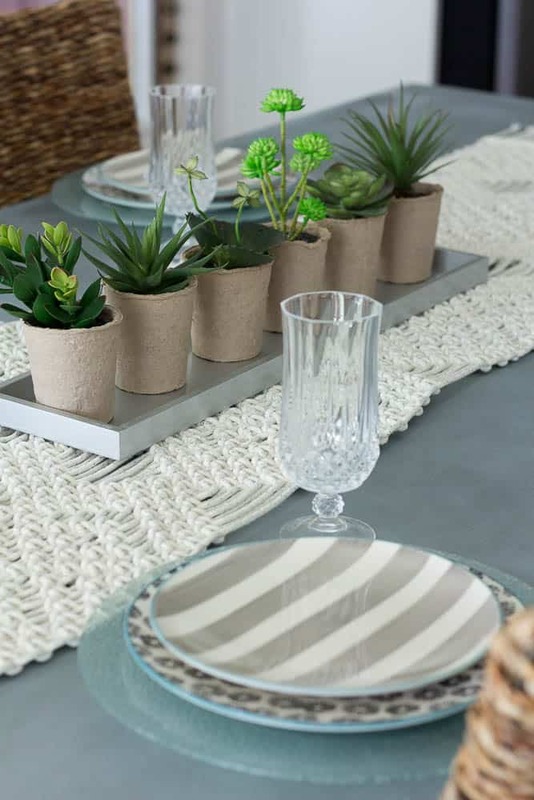 I also like the macrame table runner. Very nice. Sherry, You and your husband did an awesome job in constructing this table. It’s stunning! In fact, it’s so great that you’re being featured this evening at Share Your Style! Congratulations and job well done! What a fabulous table!! You both did a fabulous job!! Read your blog with interest. I’ve been planning a zinc top for a thrift store island purchase for my kitchen remodel. Thanks for the info -your table is beautiful. Pinned. You guys just solved a huge problem for me and hubby. Serendipity!!! Sherry, you must be so pleased with the way this project turned out. It looks amazing!! Thank you Kerryanne, for the feature! Team work makes the dream work! You and your husband did a beautiful job. Thank you for sharing with us at Celebrate Your Story, and have a great weekend. 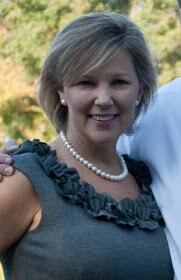 Kudos to you Sheri for having a vision and sticking to it. That is one unique table. Absolutely gorgeous table. Plus it has so much more meaning since you both built it yourselves. Great job and inspiration. Wow!! You did an Amazing job!!! Wow! Your table looks amazing! The best part is that you and your husband can be so proud that you made it! I’ve always loved the look of zinc top tables. The legs on your table are absolutely gorgeous! Sherry, it is absolutely stunning! You and your husband are amazing! Thank you for sharing. You are one of the fan favorites at the Sunday Showcase from the Make it Pretty Monday party at The Dedicated House. Pop on over to the Showcase when you have a moment! Have a great week! Thank you so much, Kathryn! I am so excited to be a fan favorite. Oh Sherry, this table is so beautiful. I can see why you wanted to keep it in your home. I’d want to enjoy it every day too. And it looks fabulous with your light too.